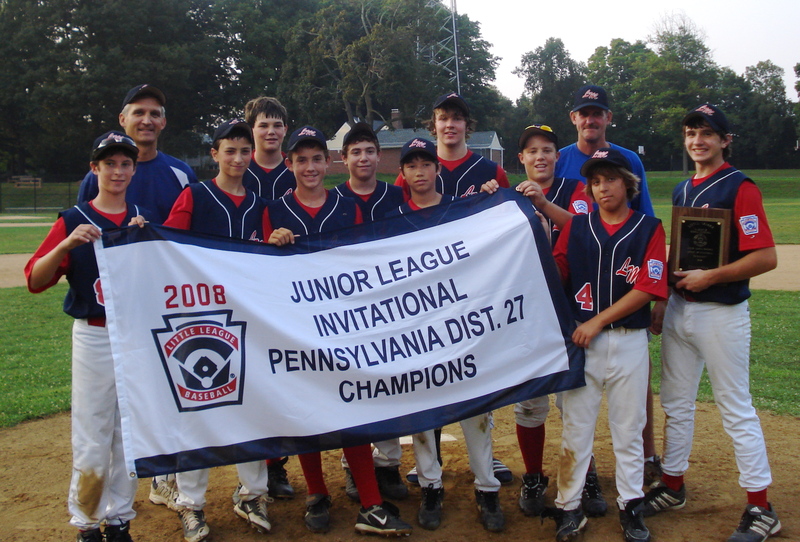 The Lower Merion Little League's Junior Division All-Stars (ages 13-14) completed another successful season with PA District 27 Runner-up honors and then proceeded to capture the Championship banner in the District 27 Invitational Tournament. This achievement culminates over five years of determination and teamwork for many of the players who are now advancing on to high school. On Memorial Day Weekend, Saturday May 24th, the LMLL Juniors Division (ages 13 and 14yrs) played a twin-bill All Star Tourney at The University of Pennsylvania's Meiklejohn Stadium, home of the Varsity Quaker baseball team. Under a clear blue sky, the morning game featured All Star selections composed from the three LM JV teams. Evenly matched squads from the Hooks, Timber Rattlers and Grasshoppers played a see-saw game that featured a come from behind win in the top of the 7th inning, allowing the Nationals to best the Americans by the score of 9-7. After a brief intermission and lunch, the afternoon game would settle the best of season 3-game match between the LM Bulls and the LM River Cats. Each team had prevailed once this season and both teams are currently leading the District 27 Varsity standings. The visiting River Cats jumped off to a big lead and held on for a wild ride against the Bulls. In a high scoring affair that would make the Phillies recent scoring proud, the Cats won 19-14. Umpire duties for the day were well executed by LM's very own Rich Pezick and Tom Cerone. Playing on a fantastic field, along with picture-perfect weather, it was truly a memorable way to spend Memorial Day weekend!